A Nightingale-Conant Exclusive from legendary life-changer Zig Ziglar! "For most of my life, I thought success was for other people, not me. This one event changed my life! Everyone has the seeds of greatness, and Born to Win helps you achieve your greatest dreams. I am living proof." Famous Dave Anderson, Founder of Famous Dave's of America, Inc. The World's Greatest Bar-B-Que Joint! "This journey to the top is going to be the most exciting and rewarding trip you'll ever take!" In two days, you won't recognize yourself. But everything else in your life WILL. Starting with your character and integrity... ending with results you didn't even know were possible. You'll build upon that unshakable belief in yourself... confidence at a level you'd never imagine attainable. You'll generate an endless supply of energy and enthusiasm that launches you to new levels of achievement and accomplishment. You'll benefit from closer, more rewarding relationships with your spouse, children, friends, and associates. be revealed in just two days! Now, I hope you don't mistake my excitement for hyperbole. Because 25 years and thousands of changed lives prove what I'm about to share with you can have a monumental impact across every facet of your life. I have so much incredible information to share with you, I barely know where to start. So I guess I'll just start at the beginning. Your beginning. You see, you were born to win. That's not simply a feel-good motivational line. It's ironclad fact. You, me, your family, your colleagues—EVERYONE—is born to win. You were brought into this world to win in your career. Win in your relationships. Win in health, win with money... WIN AT LIFE. The truth is, each of us is designed for accomplishment. Engineered for success. So regardless of where you are now, you are born to be prosperous... to be talented... to fulfill your complete potential. Right now, are you WINNING in each and every way you want? If you're not... it's not your fault. You simply didn't have all the tools to get there. Zig Ziglar's giving you the tools to START WINNING in all facets of your life . . . as you deserve. And in just TWO DAYS FLAT. Can you really change what you'll accomplish and who you'll become in JUST TWO DAYS? It sounds beyond belief. But I can assure you—the answer is a resounding "Yes!" Many thousands have done just that. How did they do it... and how can you do the same? Well, it all started years ago when thousands of people would drive hundreds and thousands of miles all in search for the same thing. A better life. For two days straight, those fortunate enough to attend this event would laugh, cry, and learn more about themselves than they had ever known. They gained powerful life-enhancing insights, motivation, and strategies. Then, at the end of those two days, armed with the perfect combination of information and inspiration... they were ready to win at life! If ever there was a single event that could ignite remarkable turnarounds in people's finances, health, relationships, and happiness, this was it. And because of its power to change lives, word quickly spread... until soon everyone wanted this in-demand ticket. to this perpetually sold-out event? The answer: Zig Ziglar, of course. The man who almost single-handedly launched the personal development industry. If you know about Zig, then you know what I am talking about. If you don't, then trust me when I say that this is Zig at his absolute dynamic best. It was his flagship seminar titled "Born to Win." And that's exactly what the privileged attendees learned to do... WIN! For 25 years, this Born to Win seminar became the virtual Master's Degree in Winning. A recipe for personal growth. The shortcut to successful living. And if you were one of the fortunate ones who attended this seminar, you are nodding your head right about now. Because you know the impact this single seminar had—and still has—on your life. When Zig Ziglar closed the curtains on his wildly popular Born to Win seminar, an opportunity like no other was lost. And in some circles, it became known simply as The Lost Seminar. For years now, people have searched for video, audio, and transcripts. Books, articles, or even excerpts... anything they can get their hands on to recapture the electric energy and opportunity that became The Lost Seminar. But no luck. Very little existed except people's memories and any notes they might have taken. I was rummaging through some old Zig Ziglar audio clips. Upon playing one of them, I was surprised to hear a woman's voice. The second she spoke, I knew she had to be a member of the audience in one of Zig's Born to Win seminars—someone so moved by his words, she was compelled to come forward. And in the most passionate and sincere tone, she spoke of the transformational power of the Born to Win seminar. In all my years, I don't recall ever hearing anyone as grateful as that lady. Her life was forever changed by one man. By one seminar. And at that moment, I knew we had to do everything in our power to offer that same seminar to our fantastic customers. So for four straight years, we tried nearly every creative approach to secure rights to The Lost Born to Win seminar. Unfortunately, we were always met with "No." And then one day, when we had nearly given up hope... "Yes!" Zig Ziglar's ‘Born to Win' Seminar is REBORN! Today Zig Ziglar's Born to Win seminar is alive again to inspire a whole new generation of achievers. Announcing The Born to Win Seminar... Recorded LIVE! Yes, the complete two-day live seminar that impacted so many lives can now be yours! It's available in our LARGEST, most idea-rich program we've offered this year! And because we packed in so many hours from Zig's other most popular seminars, it will undoubtedly become known as The Ultimate Zig Ziglar Library. What's even better, because it's available in an unprecedented 15-CD audio program and includes five video sessions on three DVDs, you can listen and watch whenever and however often you wish. The 15 CDs span the complete two-day seminar experience. Throughout the CDs, you'll find comfort in Zig Ziglar's energetic wit, down-home charm, and unforgettable stories. You see, Zig speaks to you as if you're front-row center at one of his sold-out seminars. All which allows you to prove to yourself... you truly were born to win! Yes, I'm ready to START WINNING in as few as TWO DAYS! I can SAVE $300...But only if I order NOW! From the first word spoken on the first CD all the way to the last, Zig Ziglar's message is a ray of hope that grows into a floodlight of optimism, enthusiasm, and hope. In The Born to Win Seminar, he commits to helping you change your life in just two days by addressing the most significant areas: Your character and integrity. Your self-image. Your relationships. And your goals and dreams. In Nightingale-Conant's The Born to Win Seminar, Zig begins with the most important part for creating your most promising future: The foundation. Through powerful insights and stories that will have you laughing out loud, Zig casts a spotlight on your own integrity, character, and loyalty. On this first day, you'll gain firsthand knowledge of how an unshakable character leads directly to wealth, health, and happiness. Zig says, "Whether you're building a life, a marriage, or a career, the foundation is going to determine how big and how successful and how long lasting it's going to be." Then, building on your foundation for success, Zig devotes quite a lot of time to YOU. He uncovers the real secrets that empower you to project the strongest, most confident self-image. A gift that will translate into accomplishments you didn't even know were possible. In helping you to always see yourself in the most positive light, Zig focuses on your self-worth. He says, "Think of what you would like other people to be like. Then work on yourself to become that type of person." Zig Ziglar starts the second day of his seminar with more life-transforming insights. He knows what makes people happiest in life, and that's having strong, supportive relationships. As a result of taking Zig's proven advice, your marriage will grow stronger; you'll raise confident, respectful children; and you'll discover how your relationships at work can help you achieve career and financial prominence. To close this one-of-a-kind seminar, Zig will hand you the prescription for success with his own proven goal-setting plan. Goal-setting becomes the most important part of your success. As Zig says, "If your image is sound, if your goals are set, if your attitude is right, nobody on the face of this earth can stop you from reaching your dreams." if you will just help enough other people get what they want." In The Born to Win Seminar, those words become the foundation by which Zig Ziglar helps you to discover your own personal, family, and business successes. Discover Zig's 13-step plan to achieve your goals. Engage this proven goal-achieving system and anything you want—health, prosperity, never-before-considered accomplishments—can be yours! PLUS, learn the HIDDEN TRUTH why 97% of us don't set goals. Follow Zig's Ziglar's PROVEN Prescription for Success: These seven simple steps will lead you straight to your dreams every single time! Get the absolute MOST effort from your children, your employees, friends, relatives... everyone who crosses your path. They'll go that extra mile for you (and maybe ONLY you). Create your healthiest, most confident self-image using Zig Ziglar's 25 proven steps. A strong self-worth opens the door to new success and opportunities! Accomplish more in ONE DAY than you used to in THREE, FOUR, FIVE, or even SIX days! I promise it's not an exaggeration. Watch your accomplishments soar—at work and home—using Zig's proven productivity accelerator. Maintain a constant feeling of happiness and control that lasts the WHOLE day with just ONE two-minute exercise in the morning. Better than any cup of Joe. Discover four guaranteed ways to lose weight without diets. It enabled Zig Ziglar to shed 37 pounds and keep it off. Plus, Zig shares proven secrets for enjoying your healthiest life. Raise highly respectful children who will naturally grow to be successful adults using Zig's proven steps. Believe me, you'll be hard-pressed to find these family-nurturing tips anywhere else. Plus learn the one thing most of us unknowingly do that may hurt our kids. YES, I'm ready to start leading the life I was born to live… to WIN at life using Zig Ziglar's proven strategies and perspectives. 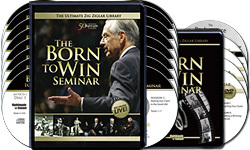 Please send me Zig Ziglar's audio and video program The Born to Win Seminar, featuring 15 CDs, 3 DVDs, and a writable PDF workbook for just $99.95, which is 75% OFF the regular program price. Take advantage of this limited-time special discount now. GUARANTEE: If I am not completely satisfied with the results I experience, I'll send the program back within 30 days for a full refund. No questions asked. "Today after 33 years, I know what I want out of life, and there's nothing more exciting and invigorating than that. And because of now knowing what I want out of life, no one can stop me. And I just want to share with you that I believe, I believe in myself and I believe in all of you. Thank you Mr. Ziglar." "...The best days of my life. [These last few] days I found a way that I hope I can make a difference." "I think Zig's message is that as we accept these principles that we have control inside of our destiny. ... Thank you again, Zig." Discover your untapped greatness in two short days... or you don't pay a single penny! Zig Ziglar lived his life by treating people with utmost respect and honesty. And that's exactly how we wish to present this one-of-a-kind offer to you. We believe this to be the most substantial and value-driven program we've put before our customers this year. You'll receive 15 audio CDs, three DVDs, and a writable PDF workbook packed full of achievement insights. Two entire days' worth of motivation and success strategies. Right now, you can transform your life by ordering The Born to Win Seminar at a SPECIAL DISCOUNTED PRICE. You can get your ticket to this incredible, life-transforming seminar simply by clicking the link below. After you listen to the seminar and watch the videos, if you aren't poised to win at life, you can return the program anytime within 30 DAYS and receive a FULL REFUND of the regular program price—no questions asked. Just imagine. In two days I hand you some special eyeglasses—custom-fit for you, of course. Now these glasses give you the ability to see things you never saw before. Through the special lenses, you'll see yourself in an entirely different light. They magnify internally all of the potential and the power and the ability that's within you. Not only that, these eyeglasses magnify the opportunities, the beauty, and the excitement and joy that surrounds you every second of the day. While wearing these glasses, your vision, your goals, and your successful future all become abundantly clear. Suddenly, you see exactly how you will win at life. Okay, as you may have already guessed: The magic eyeglasses aren't real. But your RESULTS will be real! See yourself getting that much-deserved promotion. See yourself making the kind of money you've always known was possible. See yourself as confident and in control at all times. See yourself shining in every relationship. It's all within your reach in just a couple of days as soon as you experience Nightingale-Conant's life-changing program: The Born to Win Seminar: The Ultimate Zig Ziglar Library. Talking about his seminar, Zig said, "It's going to be the most fun and exciting trip you'll ever take. It's filled with more promise of reward than King Solomon's mines. In short, this journey to the top, which you are going to be taking, is a tremendously exciting trip." Grab your "ticket" to Zig Ziglar's inspiring life-transforming event. And in two days, you'll change in ways you never thought possible. P.S. I believe life has an incredible amount to offer us. I believe we can choose the things out of life that we really want. I believe we were born to win. And I believe that Zig Ziglar's flagship seminar that he spent 25 years perfecting contains just about everything you need to know in order to start winning in life. Click the link below and be the first in line to get your ticket to Zig Ziglar's greatest wisdom at a LIMITED-TIME SPECIAL DISCOUNT PRICE! One of Nightingale-Conant's most popular authors, Zig relayed a message that is timeless. He recorded such bestsellers as A View from the Top, Goals, Raising Positive Kids in a Negative World, and Courtship After Marriage. Zig Ziglar not only developed champions, but to his family, friends, peers, and business associates, he certainly was one. Zig Ziglar was the chairman of the Zig Ziglar Corporation, headquartered in Dallas, Texas, an organization committed to helping people more fully utilize their physical, mental, and spiritual resources. A world-renowned author and speaker, Zig had an appeal that transcended barriers of age, culture, and occupation. During his lifetime he traveled more than five million miles across the world delivering powerful life-changing messages with humor, hope, and enthusiasm to audiences of all kinds and sizes, cultivating the energy of change. "And I'd just like to thank Mr. Ziglar and everyone who has dedicated their life to helping out other people. I know for myself, I'm excited about the future. Thank you very much." "I think we are going home changed people. And I thank you Zig Ziglar and all of the staff. You have been wonderful. You have been such an encouragement to us. You've made me feel special. And I thank you for that."